No Knead Bread. Let’s make life easier, shall we? I love having smart friends. Smart friends who give me great, easy, healthy recipes are my favorite kind of friends. As are my friends who give me chocolate. Or jars. Or hugs. Or the friends who listen to my constant and sometimes nonsensical chatter. And the ones who put up with my unreasonable freak-out moments of stress. And the ones who pray with me. And the ones who deal with me during soccer season when I can’t finish sentences. Well now. (stops to loudly blow nose and gain composure) I really brought all that up to say that one of my great friends, Nikki, shared this recipe with me. She’s one of my smart friends who I believe has done all of the above and then some (God bless her). Once when I was at her house, she let me try some of the bread she had made that morning. It was great! And then she started telling me how she made it. How you don’t have to knead it. How you start it the night before and how it takes about three minutes to mix up. I think I grabbed her neck, hugged her fiercely, and knocked her over when she handed me the recipe. Not really. I truly can control myself. Usually. But hey, there was a great recipe involved, so no guarantees. See, I told you my friends are great to put up with me. Cover and allow dough to sit over-night on the counter-top. 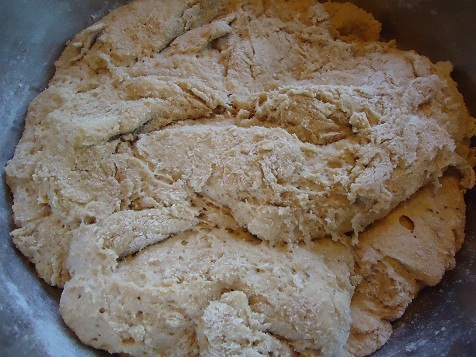 In the morning, dump the dough onto a well floured surface. Preheat the oven to 450°, heating the baking dish in the oven at the same time. Place the dough in the hot baking dish. Note: You need a covered dish to bake this bread. I found a deep-dish casserole dish with a lid that worked for me, similar to this one. But if I can save up and splurge on this one, would that not be the coolest? I highly recommend that you give this recipe a try, and that you consider serving it with this wonderful Calico Beans dish. It’s a wonderful combo! If I had a dish like that, I would be giving this one a try tonight. It will have to go on my wishlist though. That looks easy enough, I may have to give it a try! My friends are undeserved…so thankful for them. Can’t wait to try it tomorrow! And yes, friends who share great recipes really are the best! Oh…I am soo trying this. Thanks for sharing! Looks like my kind of recipe! I have never made home made bread. I may just try this. Thanks for showing what the dough will look like through all of its stages! Wow, that inspires me to make delicious bread for my family! I’d like to try this–how much water? I can’t wait to try this…although kneading dough is so therapeutic! This seems very similar to the recipe in a book I just checked out from the library. It is called “My Bread, the revolutionary no-work, no-knead method” by Jim Lahey. I would like to try this recipe also – I think we are all wondering how much water?– I am assuming that it is 1 1/2 cups. :-) thanks Laura for all that you do to make this site so fun and useful! Perfect timing! I’m wide awake (midnight my time), I have a chicken, onions, carrots, & celery cooking in the crock-pot all night so I can prepare a fabulous soup tomorrow, and there is not any reason to mix some up! I am going to try half wheat flour and half white. I’m noticing there is no oil or butter in the recipe – hmmmm. Sounds so simple I’ll have to give it a try, thanks! I used a glass casserole dish similar to this: http://www.amazon.com/gp/product/B0000CF3UW?ie=UTF8&camp=1789&creativeASIN=B0000CF3UW&linkCode=xm2&tag=wwwheavenlyho-20. All you do is mix the ingredients, no yeast proofing needed. And just leave the dough on the countertop all night, you don’t need to refrigerate! Thanks! Can’t wait to try this. Do you ever cook with vital wheat gluten? Do you leave it sitting on the counter or put it in the frig? Love my friends, and I think I’d love this bread! This looks great. I have recipes similar to this that I cook in my big cast iron pot and lid. It works perfectly and gives it a perfect round base. 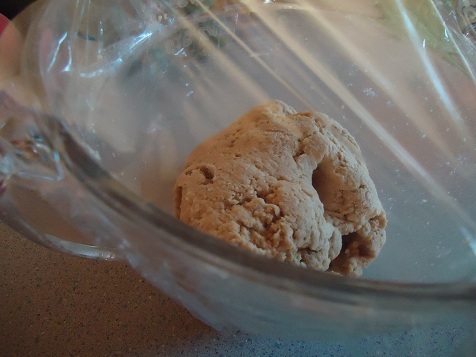 One question – do you proof the yeast before mixing the flour and salt in? Love homemade bread. Used to make all of ours. Unfortunately we have wheat intollerances at our house. May have to experiment with some other flours. Speaking of friends…I have a great one that got me hooked on your blog several years ago! I sent this post to at least 5 friends that I think would enjoy having the opportunity to make healthy bread easier. Thanks!! Oh wow!! This looks fabulous!! Thanks!!! We just moved, and I’m really missing my friends! It’s not been easy to make friends here, for any of my family, but I know God will provide friendships for all of us in time. Thanks for sharing the recipe! Just prayed for the Lord to bless you with a good church and friends. Have a beautiful day! He is there for you and loves you all so much! Thank you for stopping to pray for my family, that was very sweet of you! Looks like Artisan Bread in 5 Minutes a Day to me! Do you suppose instead of getting one loaf, you could divide it into “rolls” (maybe to be used as the bowl for some stew or chili) and bake the same “sort of” way? What do you think the baking time would be? I’m really not sure – I would imagine that it would work, but I’d have to experiment with it before I could give you baking time and etc. Good idea! I just made some sprouted wheat flour. I am so trying this tonight. Thanks! This sounds like a very good & healthy recipe. Thanks, I’m anxious to try it. That sounds wonderful! I think I’ll start some tonight so we can have it with dinner tomorrow! What a great friend! I’m going to try this recipe this weekend with a nice, big pot of soup. Looks delicious. I am gluten free these days, so, none for me…..but the family would probably love this! Thanks for sharing. Do you think I could add a couple of Tablespoons of apple cider vinegar to the water ? To reduce the phytic acid in the wheat. Or do you think the apple cider vinegar would affect the rising of the yeast? Thanks! Love this recipe. Have made it lots in the winter with hearty soups or bean dishes. Yummy!!!! I have made this many times. So easy! I’ve made it in my stainless steel cookware that is ovenproof and has lids. I’ve also made it in a loaf pan, using another loaf pan as a lid–this way, it cuts easily for sandwiches. I have also added things to the dough (add at the initial mixing)like red pepper, garlic or onion powder, cheeses, rosemary, nuts, and cinnamon. This recipe/technique is so easy and so inexpensive that it is okay to play around with to find new ways to use it. It may seem pricey at first to buy a whole jar of the yeast, but it lasts for many, many, many loaves of bread. Do you just add chunks of cheese in the AM and then bake it? Sounds delicious! I just add a handful when I first mix the dough. Can’t wait to try this after I find a covered dish to bake it in! :) Thanks. can’t wait to try this bread recipe. Looks easy and delicious. This sounds wonderful, especially with some of the add-ins that Mary Beth suggests! One question…do you greased the covered baker that you bake it in? Usually if a recipe does not say to cook in greased baker then I don’t, but just thought I would check. Thanks for so many great, healthy, EASY ideas, Laura! I appreciate your blog so much! I actually don’t mind kneeding, that’s why kitchen-aid invented the dough hook. However, with carting kids back and forth to school, preschool, activities, etc. I find that I am often not home long enough for making bread that needs multiple rises. I super excited that this bread can be mixed up the night before when kiddos are in bed and baked off in the morning. Cant wait to try a slice with a hearty fall soup. When my youngest child was born and spent weeks in the hospital, one very special friend went shopping and bought us oodles of groceries, spoiling my older kids tremendously! I made your Calico Beans last night and they were a big hit. Wouldn’t this bread be yummy with the beans????? CANNOT wait to try this. I tried your whole wheat bread recipe the OTHER way and it took waaaay too long. Not your fault, I’m just inexperienced. Sooo looking forward to trying this! Yay! Thanks! Love No Kneed bread! We keep a tub in the fridge to make a loaf when we are craving it. Just form, allow to double and the bake on a stone. We tried the cast iron covered pot and that works nice too but the stone gives it a nice European style crunch. Also there are 2 “Bread in 5 minutes” books we use too. Check them out! Great pictures too Laura!!! Can’t wait to try this bread recipe! Have to get a a dish first. That looks good. I think I would mix it in the morning, so I could bake right before dinner. My entire family likes homemade bread, so I would like to get better about it. This would be a good start, I think. Just wondering – do you really have to punch it down and reshape it? Seems like you could just heat the oven and bake as is the next morning and it would be even lighter??? You could sure try it and see how it goes! My family loves homemade bread. Can’t wait to try this! 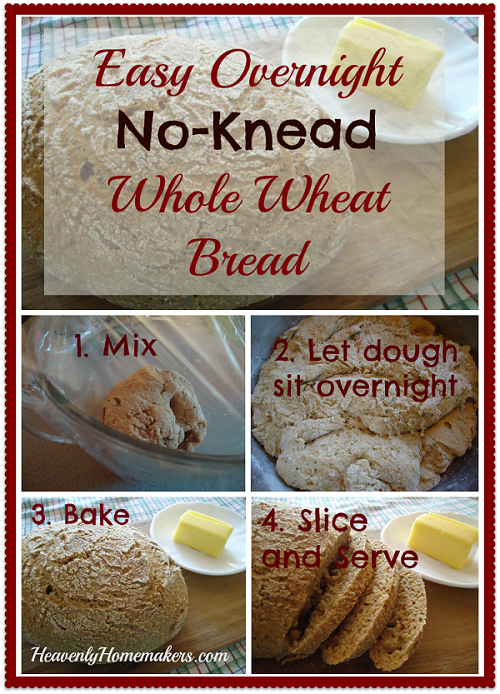 I love this idea as my family loves warm homemade bread! Especially in the morning! Thank you for your website–I am thoroughly enjoying it! This sounds like the “casserole bread” that my Mom used to make. I’m sure she didn’t let it sit overnight though, maybe a little while on the counter? Looked just like yours and tasted like heaven. Thank you so much for this! It’s exactly what I need right now. With 5 big kids and a newborn to boot, I’ve not been able to bake bread like I used to or would like to. I found the Sassafras oblong stone baker on ebay brand new for $39.99 with free shipping! I can’t wait to have fresh, healthy bread again!! Jesus, the friend who is always there! I have to try this! Thanks for the post. for us working moms, think this would work by mixing in the morning leaving sit all day (say from 7am-5 pm) then and baking in time for dinner at 6? Seems like the time for raising might a be a little shorter? A friend finds time to sit with my dd and me after a medical procedure and even brought us a meal for that evening so that my dh wouldn’t have to cook. Do you know why it has to be covered? Sounds divine! Something I must try. My husband wants me to try something not using the bread machine. Yummy can’t wait fir the morning for fresh bread. Thanks for a simplified version of this! I’ve seen this recipe and everyone makes it sound ‘so easy’ and yet kind of complicated! This I know will be easy and that you’ve done it with fresh ground wheat like we use too! I am going to try making this soon! I just love the recipes I find here, thanks so much Laura! Would a 3 qt. baking dish be enough or too much to bake it in? One of my friends brought a meal for our family BEFORE and AFTER our 3rd baby was born this summer. She knew I was feeling extra tired and one night decided to bless me with supper. It was so nice. This is awesome! I can’t wait to try it. It reminds me of Cottage Bread that my mother made when I was a kid. Thanks Laura! I have a dear friend who prays for me daily. She keeps a list of prayer requests close by so she can refer to all of our needs. This looks yummy. And easy. Thanks for sharing. I think this would be good with the Tomato soup I made from your recipe, last week! Only wish I had more tomatoes to make more. Keep the easy tips coming!!!!! I’ve done this before, but never with a covered dish. I will have to try it this way. Can’t wait to try this! We love having fresh baked bread. can’t wait to try this. hopefully i’ll remember to start it tonight. I have a similar recipe, but this one looks even easier! Thanks for sharing! I’ve made bread similar to this before. I don’t even bother to knead the dough. I just mix it all up, cover it, and put it in the oven overnight (with the heat off). Then in the morning I take it out, and put my dutch oven in and turn the oven on. When the dutch oven is hot, I dump in the dough and bake it! What size of a dutch oven do you have? Mine is pretty large and I’m wondering if it might be too big. Definitely going to try this! I hate kneading, and my stand mixer gave up the ghost on me! I’m certainly going to have to try it! And I have the glass Pyrex type dish, so I will be testing that one out. Thanks for the double confirmation, Laura! I also added a third of a cup of honey, and cooked it at 375, rather than 450 and it turned out beautifully! I made two small loaves so I could use them as bread bowls for soup tonight. The texture and taste is exceptional! Thanks for the recipe! (I made a comment above so this is not my entry, I just wanted to share with everyone the changes I made). I also live in high altitude and added 3/4 cups more flour. I wonder if you could use a bean pot? Time to dust it off & find out! This recipe sounds similar to the bread you mix up and keep in the refrigerator and pull off what you need for drop rolls. My dad often would mix up dough in the AM and put it into a gallon zip lock bag and keep it in the refrigerator until he would make rolls or pizza. Keeping it in the refrigerator just makes the rising go more slowly. This looks great! I will have to try this. Thanks for sharing. Sounds wonderful – time to go see if the cast iron camping pot can be found. I cannot wait to try this!!! Thank you for sharing – how awesome! Great recipe–I will have to try it. My friend always seems to sense when I need to talk and calls me. I can’t wait to try this!Mahalo! This bread is amazing. You can also add all kinds of add ins. I have a fabulous friend and she loves grainy bread. So when I make it for her I add oats sunflower seeds flax seeds and some spelt flour! She loved it. Tasted like we picked it up from a fancy bakery. I have figured out I can fit a glass Pyrex casserole and a cast iron one in the oven at the same time so I always bake 2 at a time! I have had this bread with white chocolate chips and craisins! It is very versatile! Glad you found this recipe. This looks wonderful. Would love to make it and share with a busy friend. I can’t wait to try this. It looks wonderful! Looks great..I am Gluten free and wondering if this would work with GF flours. If you try it, be sure to come back and let us know! Very interesting…. I’m going to try it, once I locate a proper dish. Did you need to add more than 3 cups when you used freshly ground flour? Mine first loaf is on the counter waiting for me in the morning! I am so excited! I use freshly ground and stick with the three cups no problem. I’ve been wanting to try this method (cooking inside a covered pot, but didn’t know if the crust gets hard or is softer? I don’t like a really hard crust on my bread. I would love to hear your feedback about this. 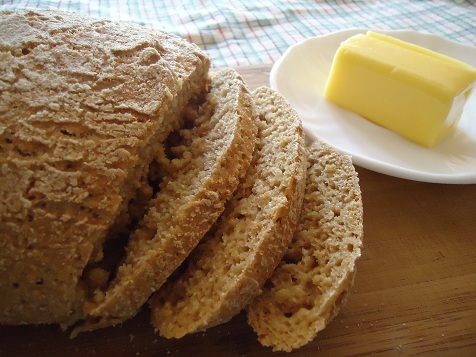 It is a pretty “crusty crust” – harder than I prefer, although still really delicous! If you wrap it in plastic wrap for a day or so it will soften up the crust. I love finding easy bread recipes…and I have some of the best friends ever. One of my friends and I both read your blog, and when we get together we talk about all of the things we have been trying that we read here! I’m also curious if it will work with a gluten free flour. What is active rise yeast? Sorry for the nubile question. I use a Breadmaker and have only used fast rising yeast. This looks so easy!! I am a working outside of the home mom, and this would be great for any day. Even if I have to work that day!! Could you add seeds to this? I would love to add sunflower and pumpkin seeds and maybe sesame seeds for extra texture but worry it would affect the rising process! Yes, I think you can add most anything to this! going to try this today!! Can’t wait to try this recipe! So easy and we love bread. Made this last night and am wondering how big the covered dish needs to be to bake this?? I assume a casserole dish would work. A 2 or 3 quart dish will work fine. I can’t wait to try this!! PRobably tonight! I would love to have the aroma of fresh baked bread to wake my family in the morning, ready for them to grab as they head out to various directions this busy Sat. Thanks for the recipe!! I’m kind of clueless when it comes to yeast…is active DRY yeast the same thing as active RISE yeast? Sounds easy enough-love the smell, and taste of fresh baked bread! Yay I will try this! Will be trying this very soon! One question: so there is no honey or sugar in the recipe? I’ve never seen a bread recipe without a sweetener (for the yeast). If we don’t need it, great! :) Thank you! I always either soak my grains or use sourdough (my youngest has dental issues) but really want to try this recipe…do you think I could reduce the water and add some ACV? Any idea how much? Thanks so much for the recipe! Did you try the bread with soaked grains? I would like to try that too. If you have any tips let me know. Thanks! Looks fantastic! And I LOVE the bowl you would like to get – just might have to save up and splurge on that one myself! I had seen recipes like this, but they were always made with white flour. I didn’t know you could do it with whole wheat! Great! Would it work to cover my dish with aluminum foil if I don’t have a covered casserole dish? I can’t wait to make this! Having it ready to pop in the oven in the morning!!! LOVE THAT! This is a smaller version of the Artisan Bread in 5 Minutes a Day recipe. That version will make 3 one pound loaves that you can make all at once or keep the dough in the refrigerator for up to two weeks (more sour doughish at the two week point). My family LOVES that bread. So glad that cold weather is coming so I can start making bread again. I prepared my dough last night and just finished baking this afternoon. It worked just like you said , i have always had a fear of using yeast the whole kneading and proofing etc. but this was super easy and my family loved it!! thanks I will be making this again and again!! My friend Lisa has shared with me so many of our super healthy recipes… I love it and I love her!! I can’t wait to try this. I have some wonderful friends as well. Some of them turned me on to making my own bread and grinding my wheat. That got me started on this fun ride to switch to no processed foods. Can’t wait to try this. Love having friends that challenge me. I just want to caution you…it wasn’t clear from your post visually, but if you are cooking in a Pyrex-type bowl, Pyrex strongly cautions against not putting one of their glass items into an oven that is not fully preheated, as well as NOT putting something cold into a hot container. http://www.pyrexware.com/index.asp?pageId=32 The dramatic temperature change can cause the glass to shatter and I would hate to see you or anyone else hurt. Most recipes that I have seen that use this style of bread-making call for a cast iron or ceramic-coated (similar to Le Cruset) style of Dutch Oven, which allows the bake ware to be preheated in the oven before adding the much cooler bread dough. As for the recipe, I think I just might give it a try this weekend. I have made Jim LaHey’s No-Knead bread before, but this one seems even simpler. Thanks for sharing! So you cover the bread while baking or only cover it overnight? I think you cover the bread while it is baking too. I just made a loaf this morning and covered it in the oven. It was so amazing how easy it was and how yummy too!! Love it! Do you have to use seasalt? My husband is on a low iodine diet for the next few weeks and cant have seasalt. You can leave out the salt if you need to. Yummy! This looks like my kind of recipe! I think you just handed me a recipe I’m not afraid to try. I’m not good with bread products. I ruined pizza dough. Seriously. So I’m pinning this for when the weather cools down just a wee bit more so that i can make it. Ok. I have that exact covered baker and have yet to use it. I’m curious if this recipe will fill it full. I am going to try. Maybe double it. Looks simple and absolutely delicious! We’ll have to try it! Loved the first commenter’s suggestion about white choc chips and craisins! I am soooo trying this recipe!!! Thank you for sharing! I can’t make bread or anything involving yeast to save my life. I just can’t knead correctly I guess. I even watched your youtube video Laura where you show how to knead bread…yeah, didn’t work for me. I think I need someone in my kitchen teaching me! This sounds so easy!!! I’ll have to try it! I cannot figure out how the science works on this bread since there is no sugar! I am anxious to try it though! This is very similar to a recipe for English Muffin Bread that Crystal Paine posted on her blog, MoneySavingMom.com. I have used it a few times, it is very easy, and my family really enjoyed it. That recipe does use a bit of sweetener though, so I am eager to give this one a try. This is perfect for those busy times when doing a yeast recipe seems just too big. Thanks for sharing. Baked my first loaf this morning – it is AMAZING!!!!!!!!! This will be a new regular in our house!! Thanks, Laura!!! One question: I wasn’t sure if I was supposed to grease the dish before baking, so I went ahead and did it – but do I need to? I don’t typically grease mine, but it won’t hurt if you do! What will happen if you don’t use a lid? I made my first loaf today and I love how super easy it is! Question, when I take it out of the oven should I cool it on a rack? Also, when I put it on the floured surface this morning, before I baked it, I was afraid of overworking it trying to get it into a ball..I tried getting it into a ball shape and then it would just kinda spread out from there…hope that makes sense, so it didn’t stay in a ball shape. I’m wondering if I should have mixed it more the night before….? When I took mine out of the oven I did put it on a cooling rack. I also rubbed butter on it to soften the crust. I did not work mine much. I split it in two, put it on the floured surface, rolled it a few times, then put them in their baking dishes. This way they were the perfect zsize for bread bowls for soup. If yours did not stay in the ball you needed to add more flour. Thank you so much, I will try with more flour next time! It was a big hit here! The flavor is wonderful and with the process being so easy I could see myself making it a couple times a week! Thanks for sharing. I don’t think you need to change anything about the mixing. It is just kinda funny to shape into a ball when it really just wants to flop around. :) Just work very lightly on the counter (about 20 seconds) then let it take on the shape of your baking pan. I don’t cool mine on a wire rack – I typically just put it on the stovetop, but you sure can put it on a wire rack if you want. I have a friend that is so great she GAVE me a grinder to grind my grain! My first loaf is in the oven, but I’m a little concerned it won’t turn out… the 30 minute “Resting” on the counter didn’t make the dough rise at all. I’ve never had bread rise more in the oven and I’m thinking this is going to come out like a dense brick :( I’ll let you know, but is it supposed to do a full rise again after you shape it? No, it doesn’t rise much after you shape it, but I try not to over work it when I’m shaping it so it keeps some of its “puff”. Mine usually comes out more dense than a regular loaf of bread. Hope yours turned out okay! Well, it didn’t rise much, like you said, but it was still very nice! I have the sassafras oblong baker so it made a nice “french bread” looking loaf, although kind of short. The bread is nice and chewy, like a sourdough. Thanks so much for sharing this! With regular bread rising time I could never have fresh baked bread for breakfast, but with this method, I could have it every morning! This looks amazing…gonna try it this week! Guess I’ll be making this tonight. Turned out pretty good….a little “chewy”, but good. I am sorry to ask this question that it may be obvious to everybody. But I am not sure if I am understanding this correctly. When you say to put the dough in the hot baking dish and cover. Do you mean the same baking dish used for he overnight? Or it could be any other baking container or sheet? Thank you in advance, for any imput. You can use any baking dish as long as it has a lid! Thanks for this great recipe! We tried this morning and everybody loved it, especially my husband and asked me to make it again. So simple, a few ingredients and even my kids can help. Thanks a lot Laura, you really inspire me! I was wondering how long this bread needs to sit before its baked? I am asking because I want to bake it and eat it hot for dinner. So, could I make it early morning so that I can bake it right before dinner? And if so, how early would I need to mix I t if we wanted to eat it at 6:00 pm? Thanks for the help? Yes, you can definitely do this in the morning and have it ready for dinner. If you start it around 8ish you’ll be good to go! What do you think if I let it rise even longer? Would it be too long? Like if I mix it at night for dinner the next day? 10-12 hours. After that you can put it in the fridge for up to 7 days. Remove from the fridge about 1 hour before you bake. I agree. I think leaving it to rise longer will be just fine. Do you have an easy recipe similar to this for a cinnimon raisin bread? No I don’t, but I bet you could adapt this one to make it into cinnamon raisin! sorry about your dish! i am curious if you adjusted the recipe at all w/ your spelt loaf; spelt is my flour of choice, although i haven’t used it a lot yet, but i know substituting it doesn’t always work really well. I may have added a little extra spelt flour but usually I just sub it 1 for 1. Also I have learned with spelt that its good to add the reccommended amount of flour and let the mixture sit for about 15 minutes to let the liquid absorb the flour. ok, thanks for the tip & info! Can you use regular loaf pans or do you have to use a baking dish that has a lid? It’s because the lid captures the moisture and lets the bread steam and bake at the same time. I baked this in the normal aluminum pans and it turned out great. I added abt 1/2 tbsp of butter to the dough and it was very moist. Also, i didn’t use a cover while baking. Thank you for sharing this recipe! I gave it a try and improvised lid onto a dish. I had my doubts that it would turn out well but when it was done it looked beautiful and artisan and tasted lovely. Thank you for sharing. My family loves this bread, and we, especially, like it with this infused olive oil that I thought I needed to share. It is a healthier alternative to butter. In quart-size mason jar mix all ingredients; shake well; allow it to “infuse” for about an hour before serving. Use as dipping sauce for bread. You will need to refrigerate if using cheese. Acids can retard botulism, but since acids & oil won’t easily mix together, that won’t help with homemade infused oils. (You add acid when canning tomatoes because today’s tomatoes are less acidic than in the past. “Doctoring” safe recipes for things like salsa can end up decreasing the required acid, and you end up risking development of botulism. I totally forgot to put this bread in the oven this morning. I wonder what it’ll be like after sitting out for 24 hours! I have always made mine in a pyrex covered casserole dish. It works great! I haven’t, but I would imagine that would work great. Thanks for the idea! Wanted to tell you I ended up going for it the other day! It turned out beautiful in the Cast Iron. I used a deep one and a smaller one for a lid. Greased it in a little lard and sprinkled cornmeal on the bottom. I did take it out once and tap on the bottom and decided it was not done enough and put it back in for a few mins. but it turned out great! I am sorry one more question what is the temp. of the water need to be?I just noticed that. Hi, this looks great! I was wondering if I could add some dried herbs to the dough? Thank you. I don’t see why that wouldn’t work! I had to add almost a cup more flour because it wasn’t holding a shape….I used fresh ground white wheat….any reason this may have happened? Thanks! Mine never holds a shape either. It still works and makes a really tasty loaf. I just came across your site and this recipe sounds divine! Since I dont own an ovenproof dish,do u think this would work in a disposable aluminum deep pan with a cover? Thank you for responding. I will definitely let you know how it came out once I try it! I made this bread and it was very dense in the middle. So I baked it for another 15 min. It didn’t improve on the texture. I did not warm the water before pouring it into the flour mixture, because it wasn’t stated in the recipe. I also used sprouted white wheat flour. Could that have been the reason my bread didn’t turn out? Thanks. Maybe I’ll try it again. I don’t think ANY mom that provides a fresh loaf of bread on the table is lazy!!!! this looks amazing! i can’t wait to make it! i currently am making our bread (6 loaves) & freeze the extra, which keeps us in bread for a few wks. however, during busier seasons w/ farming, sometimes i cave & buy bread (gasp!) due to lack of time. that’s not happening anytime soon now! =) thanks for making my day…literally! I bake this in a loaf pan and cover loosely with foil. It creates the same effect as a lid and gives a better shape for sandwiches. I also store it wrapped in plastic wrap or in a baggie while it is still a little warm to help soften the crust just enough for easier slicing. You can also substitute the plain water with water you have boiled potatoes in for a potato bread. Tastes very good as well. has anyone ever tried to sub some buttermilk for water to soak the grains? Not sure what I did wrong but this came out super dense and heavy. Minimal handling, fresh, just opened yeast. After 50 minutes @ 450, it was still wet/shiny on the top. Another loaf bites the dust. All I can think of is that maybe your water was too hot and killed the yeast? Super bummer that it didn’t work!! I used a thermometer and the water was 104.3? Glad the rolls turn out well! 104 should be fine – not sure what’s going on! Very nice! If my husband hadn’t taken it out when the timer went off at 30 minutes, the center would be as fluffy as the rest of it. The taste and texture are amazing. Thanks for sharing! Our family loves this bread! It also makes the most amazing pizza dough. I used the kitchen aid mixer and my dough was pretty wet and airy. and put a tsp of olive oil in before dropping the dough. I was worried that it would stick. Just seemed counterintuitive to not grease the pan but I am sure it would likely have worked just as well without it. So I was worried but, it cooked up perfect! Kids ate with cream cheese and me with real butter! Thanks for sharing. Nothing like a good recipe that turns out just right the very first time! I just made it and it wasn’t bad. I probably worked it too much as it was somewhat dense. I want to mention that I have never made bread! I’m in the middle of reading Michael Pollan’s “Cooked” -chapter 3 (“Air”) talks all about bread, and the info. on commercial baking was enough to get me surfing the internet. I’m really interested in doing sour dough (which is a better approach if you want various nutrients to remain in the bread or become accessible). I don’t have a grain mill but thought I’d go in baby steps and when I came across this recipe, it seemed the place to start. 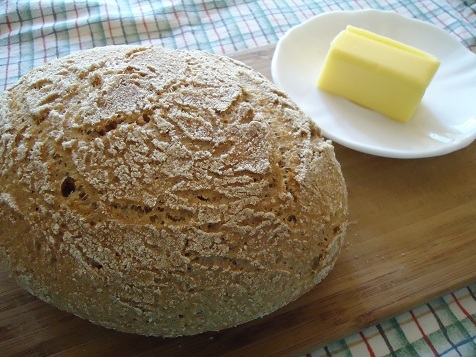 I used Bob’s Red Mill Whole Wheat – it came out fine, although other kinds of wheat (especially if you have a grain mill) probably would be better. I’ll be trying again! Don’t overwork it when you’re shaping it – you want it to keep the air that it has in the dough. 20 sec of working. Can substitute spelt flour 1 to 1. With spelt, add the recommended amount of flour & let the mixture site for 15 min to let the liquid absorb the flour. If possible, could you explain how you soak spelt flour for this recipe? Do you mix the (warm) water + spelt flour for the recipe together with 1.5 T acid (buttermilk/whey/plain (cultured) yogurt/lemon juice), and let it soak for 7-24 hours (and as I understand, longer (up to 24 hours) is better)? Then do you mix in the yeast & let it sit for another 24 hours, then shape it and let it sit another 30 minutes? I’ve never done this soaked grain thing, but wanted to try this with spelt flour, and in another comment, someone mentions soaking spelt flour makes for better results. Are there any adjustments necessary for this recipe? Thanks again! I’m still eating my first loaf made with Bob’s Red Mill Whole Wheat – as I said before, it was heavy but edible. Perhaps soaking that flour would have helped! We can’t be too much help on that one as we haven’t used spelt flour with this recipe. Hope it works out well for you! make bread with kneading etc. maybe that is on my future:) at least I have found a way to have healthier bread. Thank you for all your recipes! This was very easy to make and delicious! I used all purpose flour this time. I’ll try a blend of whole wheat and all purpose next time. Thanks for sharing this great recipe! Still haven’t made this bread yet, but want to…. got lots of good reviews…..yeast just scares me….. but I just think I will give it a try…. Still reading your blog Laura, how are you doing with the baby? I think the last I read you were adopting the baby right , or just being a foster parent ? Since you don’t have a girl, you just might not want to let her go, and adopt her yourself…..I think you’d love it….all Mothers ‘ need a daughter and now you have your chance….go for it……God Bless you Laura and your husband and your boys…..and the little girl you have….